Workmen aboard the 'Tackeroo Express' In the autumn of 1914, only months after the start of the First World War, construction of two large camps began on Cannock Chase. The camps (known as Brocton Camp and Rugeley Camp) were constructed with the permission of Lord Lichfield, on whose estate they were being built. The infrastructure for the camps, including the water supply, sewage systems and the roads all had to be created from scratch before work could begin on the huts and other structures. A large workforce was assembled to build the camps and the associated railway,later nicknamed the 'Tackeroo Express' with more than one hundred men working on the construction of the camps at any one time. Water was supplied by the South Staffordshire Waterworks Company, and electricity by the Cannock and Rugeley Colliery Company. The camps were based upon a complex of timber huts adapted for specific purposes such as barracks, mess rooms and workshops. Following the implementation of the camps' infrastructure, the first huts were under construction in March 1915 and the first battalions arrived soon after. 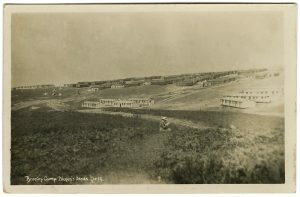 During the early part of the war the camps were primarily used as transit camps to accommodate Service Battalions travelling towards the western front; following their completion, the camps settled into the mould of a training facility and there was a steady influx of battalions, including men of the New Zealand Rifle Brigade, who later made Cannock Chase their UK headquarters. Various schools of war were established, offering instruction in musketry, scouting, signalling,physical training, gas warfare and many other related subjects. 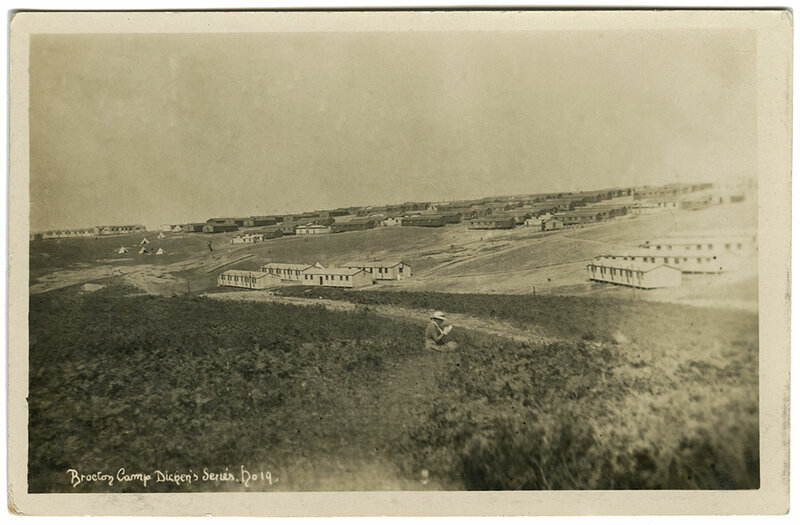 The camps, when completed, could hold up to 40,000 men at one time and probably trained upwards of 500,000 men. They had all their own amenities including a church, post offices and a bakery as well as amenity huts where the troops could by coffee and cakes, or play billiards. There was even a theatre. A hospital serving both Brocton and Rugeley camp was established at Brindley Heath in 1916. The hospital had twelve wards with a total of one thousand beds and served the camps for the remainder of the war, as well as housing convalescing soldiers from France. Following the war, the camps became akin to ghost towns, the rows of huts stood empty in an unaccustomed quiet, disturbed only by the sighing breeze swinging a loose door or rattling a window. Gradually, at the request of Lord Lichfield, the huts were sold off and were transported to their new locations by horse and cart. When the hospital finally closed in 1924 however, many of its buildings were taken over by local miners and their families. The area was known as Brindley Village and became a thriving community with a school and other amenities, until this too was cleared in the 1950s.